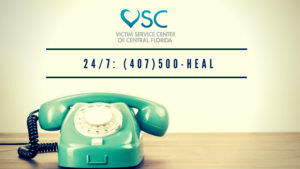 Survivors can come together and connect over shared themes they experienced connected to their sexual trauma. Johnnie, Registered Mental Health Counselor Intern facilitates the meeting and shares grounding techniques that survivors could use at any time. In previous months the discussion took off from a single conversational starter, and by the end of the evening, everyone in attendance agreed they felt less alone. 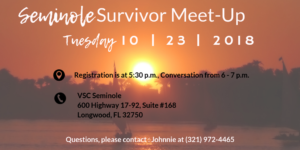 If you’d like to connect with other sexual trauma survivors for conversation and more, join us at the next monthly meeting.For more information, please contact (321) 972-4465. Please note space is limited so plan to arrive early, and if you are not currently a client of VSC you will need to arrive by 5:30 p.m. to check in, and the conversation will begin at 6 p.m.